Casco Bay area local history museum. Maritime history museum of Portland Harbor. Portland Harbor Museum is organized to preserve, promote and support the maritime heritage of Portland Harbor, its towns and islands by collecting, preserving, studying, exhibiting, publishing and interpreting information and artifacts bearing on the maritime history and culture of the area covering a time period from prehistory, through the ongoing present and into the future. Find out how a clipper ship was put together. "Nineteenth Century Wooden Shipbuilding," a permanent exhibit features the massive bow assembly of the "Snow Squall." "Serving a Great Port," the current rotating exhibit, celebrates the Portland pilots, tugs, Coast Guard, and firefighters who keep our port safe and efficient. Walk out on the jetty for a close-up look at Spring Point Ledge Lighthouse. Check our web site for lighthouse interior tour dates. Spring Point Light is one of a few remaining "sparkplug" architecture lighthouses. Lighthouse enthusiasts get a double header with a short stroll over to the Portland Breakwater "Bug Light" Lighthouse. Take in the magnificent vista of Casco Bay islands, forts, and passing ships from your grandstand Spring Point seat at the edge of the Portland Harbor main ship channel. Inspect the ramparts of Fort Preble. 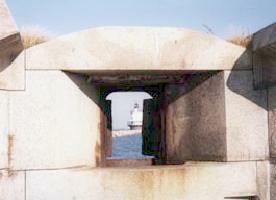 Its granite walls and gun ports enclose the seaward side of the museum campus. Before you leave, don't forget to pick up a locally-made nautical gift at the museum gift shop. Portland Harbor Museum offers much to do in one stop, including a changing maritime history exhibits, museum gift shop, Spring Point Ledge Lighthouse, historic Fort Preble, scenic shoreline walkway and sandy Willard Beach. Group tours with lunch and historical lecture series available. The Angell Collection of over 500 century-old glass plate negatives and accompanying phot prints. The South Portland Shipyard Society collection documents the building of 266 WWII Liberty Ships in South Portland. 2. Public tours of the Spring Point Ledge Lighthouse, Sat. Sept. 16 from 10am - 2pm. $5 includes admission to exhibit gallery. "Menhaden-Whalemen: How Fishermen from the Gulf of Maine Pioneered Modern Whaling"
How an innovative application of steam power was used at sea to kill whales, and render them in companion on-shore plants. "The Penobscot Expedition of 1779: Its History and Archaeology"
Warren Riess, University of Maine Maritime Historian & Archaeologist Revolutionary War expedition against the British in Castine - the search for and archaeological study of its remains. "Spies Ashore - The World War II German Landing in Maine"
The 1944 landing in Maine by a German intelligence officer and an American traitor. "Days of Joy & Fear: 19th Century Maine Women at Sea"
The daily lives of Maine women who sailed aboard their husbands' ships. "The 19th & 20th Century Irish Dock Workers in Portland"
The predominently Irish longshoremen who loaded and unloaded ships on the Portland waterfront. The history and heroic folklore of the lightshipswhich played a major role in guiding mariners of an earlier time. which focuses on early tourism through the present, including a planned cruise ship terminal. Adults $2.00; children under 12 and members free. From Interstate 295 take Exit 6A and follow Rte. 77 to South Portland. Follow Broadway until it ends; turn right and follow Pickett St. until it ends on the S.M.T.C. campus. The museum is on Fort Rd. by the water's edge. From the Maine Turnpike (I-95), take Exit 7 and ignore all exits until road ends at Rte. 1. Turn left on Rte. 1 and at fourth traffic light bear right onto Broadway. Continue as described above.